Your child is making big moves in preschool. They're progressing from learning letters to learning words, from using scissors to measuring in cooking class. Preschoolers ask questions nonstop and want to do more and more by themselves. It's an important time as preschoolers acquire the crucial skills necessary for them to enter Kindergarten -confident, well prepared and with the desire to learn! Preschool provides the freedom and opportunity for children to develop and grow in independence and confidence. An engaged child learns! While having fun, they aren't even aware they are developing reading and math skills. In addition, your child will gain the social skills necessary to succeed in Kindergarten. Through small and large group instruction and activities, teachers focus on every child as an individual enabling them to gain knowledge and thrive. Our proprietary Seedlings Early Childhood Education Curriculum utilizes theme-based lessons to strengthen their emerging skills in reading, writing, science, technology, and math. Through teacher guided instruction and child-led exploration, Kindergarten readiness is fostered. Lightbridge Academy balanced focus on effective communication, the ability to follow instruction, and how to work cooperatively with peers. Enrichment programs such as Spanish Sprouts, Signing Sprouts, Singing Sprouts, and Handwriting Without Tears® expand on key building blocks. By embracing every moment as an opportunity to learn, all developmental areas are met, unlocking every child's potential. Creative Arts & Music: Together, we explore tempos and rhythms, sing in groups, learn about instruments of all kinds and create beautiful artwork, thanks to increasing hand-eye coordination. Physical & Well-Being: Learning to live a healthy, active life begins in the preschool years. Large motor activities along with small muscle strength are both necessary for building fine-motor skills and healthy bodies. They're developing large motor skills for sports and dance, and fine motor skills for writing and playing music. Language & Literacy: The preschool years are critical for language, literacy and a love of reading. Together with fostering verbal communication, reading and writing continue to develop through creative journaling and a classroom filled with labeled items expanding their vocabulary and sight word knowledge. Mathematics & Science: One day it's interactive learning on the whiteboard visiting an ocean through underwater webcams and the next day it's STEM activities or exploring abstract geometric patterns. Social & Emotional: Children are building confidence and self-esteem by choosing playtime partners, forming close bonds, and taking care of personal needs all by themselves. Cognitive: The development of reasoning skills allow preschool children to create innovative solutions as well as the ability to persist in solving difficult problems. It's all about the individual as we learn through a variety of themes and styles, so every child progresses naturally and without frustration. "I asked my daughter what she did today and she said, 'We visited a watering hole in Africa and watched the antelope!' and then shared details. I am thrilled with how engaged she is with learning." 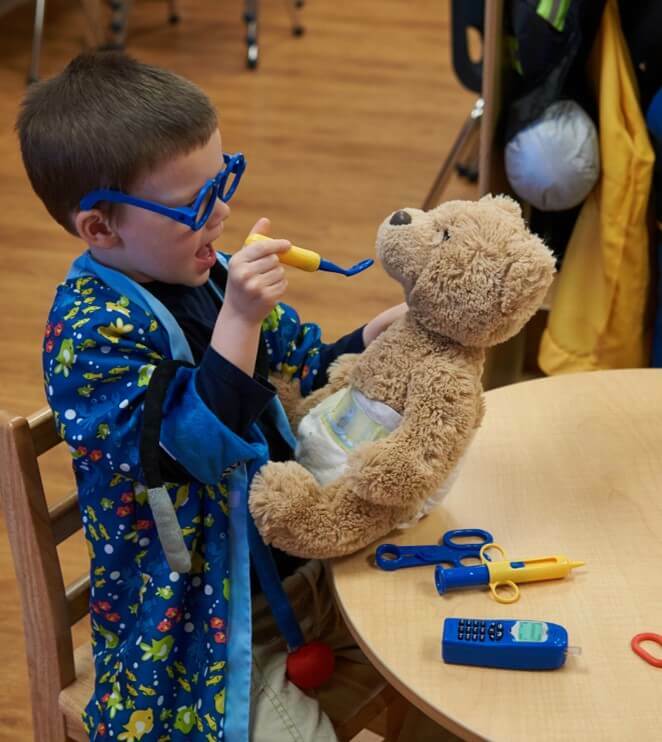 Our preschool teachers are warm, nurturing, committed early childhood professionals who are masters of finding exciting ways to encourage your child's development with hands-on activities, active participation, and exploration. Children thrive and develop in different ways, at Lightbridge Academy, we cultivate an atmosphere that expands their innate abilities and builds on their strengths. Our educators encourage children with a "Learning is Fun" philosophy through play and positive reinforcement. Preschool classrooms are big, bright and cheery, with lots of room to explore and space to create. A place where teachers, parents and children feel comfortable and at-home. Arranged in center-based learning environments, your child can follow their interests to the Building Center, Imagination & Expression Center, Reading Center or one of many others. With fun-filled and age-appropriate puzzles, manipulatives, games and toys, children love learning. Interactive white boards and iPad technology tables capture the attention of students. Teachers foster active participation and children are engaged through a stimulating multimedia learning experience. Parent eCommunication App - Receive reminders and notifications of your child's achievements, photos, video clips, food schedules and more every day. Peek-of-the-Week - Stay one step ahead of your child's events and activities. Peek-of-the-Weeks are created to keep you informed of the curriculum, activities, special visitors and all that will take place the following week. You will receive these electronically or in-hand each week. Meal Plan - Lightbridge Academy has nutritious options available for you to choose from. We make sure to appeal to even the most finicky eaters, and you can be sure your preschooler is happy and eating well. Snack Program - Your child's health and safety is our number one priority. This includes the snacks provided for them to eat during morning and afternoon time. Healthy options include fruits, vegetables, whole grains and protein options.